It’s become a tradition now for the Shakespeare Institute in Stratford-upon-Avon to spend most of June reading the surviving works of writers contemporary with Shakespeare. 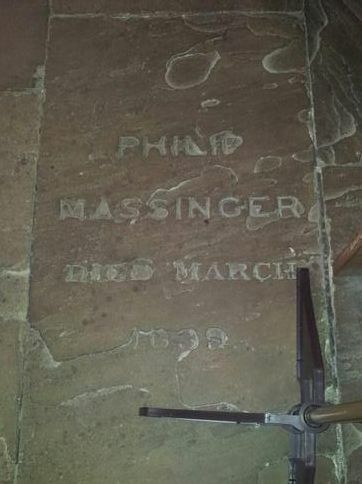 In 2018, beginning on 11 June, it’s the turn of Philip Massinger, one of the less well-known of them. His plays are rarely staged, but academics have given them more attention. A New Way to Pay Old Debts, surprisingly, was one of the most popular plays of the early nineteenth century. The famously intense actor Edmund Kean discovered in the leading character, Sir Giles Overreach, an ideal vehicle for his talents. Kean’s Richard III was renowned, and he made this role “a Richard III of common life”. In his hands the play, probably never a particularly funny comedy, became a melodrama. Overreach is a wealthy man who tries to buy his way into the aristocracy, using a combination of explosive rage and threats of violence. Kean’s interpretation was called “the most terrific exhibition of human passion” ever seen on stage. In the end, though, he is defeated by the members of the upper class which he aspires to join, and loses his mind. The play was staged by the RSC in 1983 at its studio theatre The Other Place in a wonderfully-cast production which featured Emrys James in the leading role. James never became a household name but he was a powerful stage actor and ideally suited to the role. Irving Wardle wrote “He begins as a classic image of the wicked squire; but as soon as the intrigue gets under way he outdoes the surrounding menagerie in grotesque behaviour…his face working through a malevolent bestiary from snarling dog to smiling crocodile…When he finally goes mad, he caps a bedlam shriek with a still terribly lucid monologue”. 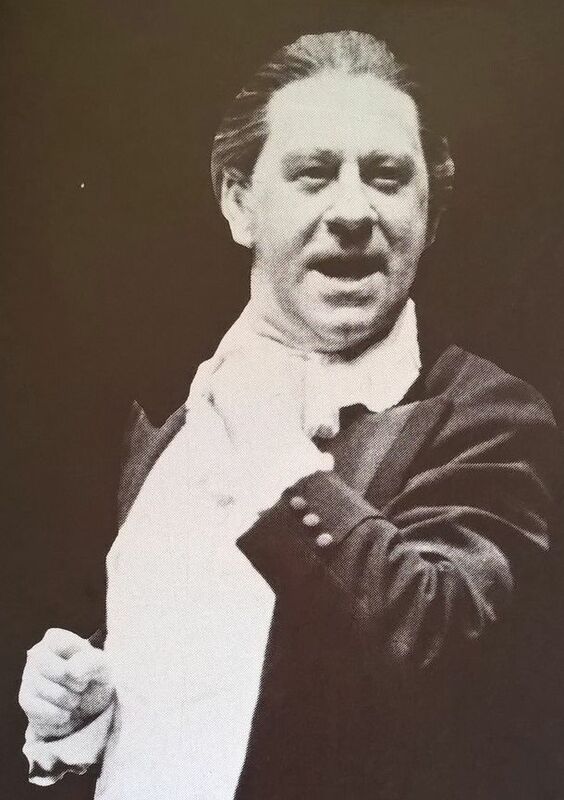 The production, directed by Adrian Noble, was criticised as a “grotesque pantomime” and a “nightmare children’s party”, though I remember enjoying it enormously, in particular Emrys James’s performance. 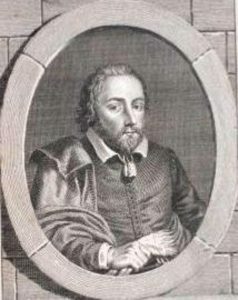 Massinger died in March 1640 during the build-up to the Civil War. He was buried in St Saviour’s, Southwark, now Southwark Cathedral. He is said to have been buried in the same grave as John Fletcher. 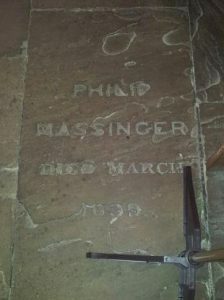 A slab is in the Cathedral but this was probably put in place during the nineteenth-century renovations. At the same time stained glass windows were installed, dedicated to a number of famous people associated with the church. These included Shakespeare and Alleyn as well as Massinger, but all were destroyed in 1941 as a result of wartime bombing. In 1954 a brand new window to Shakespeare was created, but not, sadly, those to other people of note. There’s a lot of information about the history of the church here. If you wish to join in, you’re welcome but if you’re not already known to the Institute you should contact the organizer, Dr Martin Wiggins (m.j.wiggins@bham.ac.uk). The website giving all the details is here. Incidentally the website also includes links to online texts of the plays, and anyone wanting to tweet about the session should use the hashtag #massimara. The full timetable is also reproduced below. This entry was posted in Legacy, Shakespeare's World and tagged A new Way to pay Old Debts, Adrian Noble, Edmund Kean, Emrys James, John Fletcher, Philip Massinger, Shakespeare Institute, The King's Men, The Other Place. Bookmark the permalink.